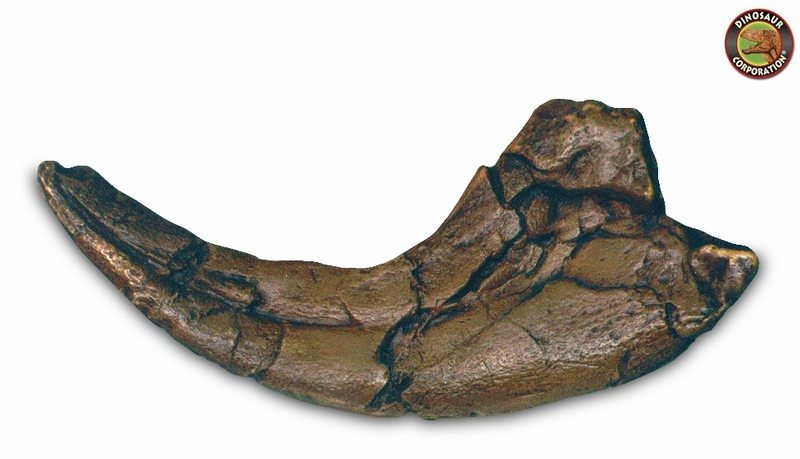 Utahraptor Claw. Dinosaur fossil replica. Utahraptor (meaning "Utah's predator" is the largest known member of the theropod dinosaur family Dromaeosauridae, and dates from the upper Barremian stage of the Early Cretaceous period (132-119 million years ago). Like other dromaeosaurids, Utahraptor had a huge curved claw on the second toe that could grow to 23 centimeters (9.1 in) long. The animal may have grasped its prey with its forelimbs while kicking with its hind limbs. Recent tests on reconstructions of the smaller Velociraptor suggest that claws of this type were used for stabbing or suffocating its prey, not slashing into their hide. Up to 6.5 m (21 ft) long, 2 m (6.6 ft) tall, and 700 kg (1,500 lb) in weight, Utahraptor would have been a formidable predator.